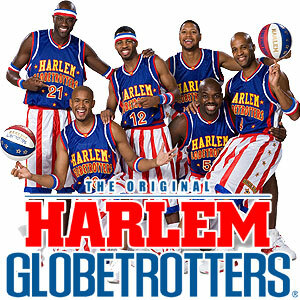 The Harlem Globetrotters are an iconic exhibition basketball team, known for their entertaining antics on the court. Initially known as the Savoy Big Five, the team originated from the south side of Chicago in the 1920s. In 1928, a touring team called the Globe Trotters were formed and toured southern Illinois, and by 1929, their manager and promoter renamed them the New York Harlem Globetrotters. An interesting fact is that the Harlem Globetrotters did not actually ever play in Harlem until 1968! Over the years, the team has played in over 115 countries in front of millions of fans. They were inducted into the Basketball Hall of Fame in 2002, and even have their own star on the Hollywood Walk of Fame. You may recognize the team song, "Sweet Georgia Brown" by Brother Bones. It is sure to get everyone up on their feet and clapping along as the team takes the floor to get warmed up! The team members are, first and foremost, amazing athletes, but also bring an element of comedy to the sport of basketball. The Harlem Globetrotters love getting the fans, especially children, involved in the game. The Harlem Globetrotters will perform at KFC YUM Center on Friday, January 13th at 7pm. Tickets can still be purchased. Don't miss out on this event that the whole family is sure to enjoy! Before heading to the game, take some time to check out these current homes for sale in the downtown area. If you are interested in seeing any of these listings, contact Family Realty to schedule a showing.